It is safe to state that any given mold will require a certain amount of repair for damage occurring during the use or storage of that mold. The more it is used, or the longer it is stored, the more damage will occur. Damage that occurs during use includes items such as broken core or ejector pins, peened parting lines, and worn gate areas, while damage most common during storage is in the form of rust. It is a good idea to save the last shot from any production run and keep it with the mold in storage. This provides a visual example to the mold maintenance area of how the parts were being produced. A repair person can inspect the parts to determine the fitness of the parting line, cavity surface condition, ejector pin position, and other pertinent information. A written statement of problems seen by the molding room personnel should also accompany this last shot. Improper care is a major cause of damage to molds. The use of metal screwdrivers to remove stuck parts results in scratching the cavity surfaces. This scratching causes appearance defects on the molded part, but may also affect a specific dimension and cause it to be out of tolerance. It may also act as an undercut and cause subsequent parts to hang up and not eject, or at least crack. Failure to lubricate moving components, such as slides and cams, or leader pin bushings, will result in a galling of the sliding components that will eventually cause the components to seize. Even wiping the cavity surface with an improper rag can cause slight to major damage to the highly polished surface. 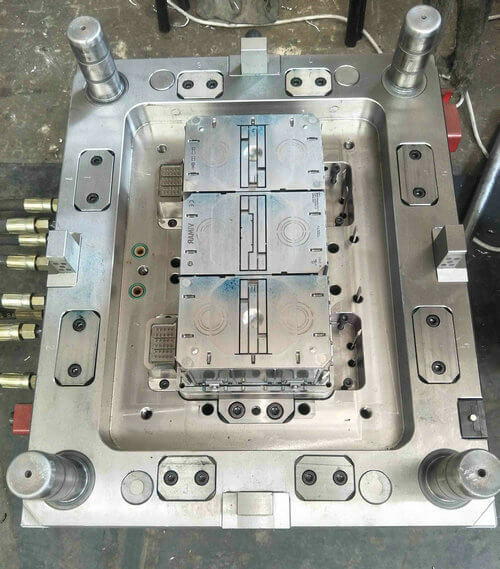 Improper processing can cause major damage, such as when a process technician uses too much injection pressure at start up and flashes the mold. That flash can force its way between leader pins and bushings, or down ejector pinholes, or into vertical separations, and can force the sidewalls out or move around slide mechanisms and cams. This can lock the mold in place as it tries to open. Allowing the nozzle to drool can result in material oozing onto the A side of the cavity set. This is usually thin material that solidifies quickly and becomes a hardened sheet of plastic. If it is allowed to stay, it can cause heavy damage to the cavity set when the mold closes on it. If mold temperatures are not properly controlled, a portion of the mold can run at a higher temperature. If the difference is?greater than 10° F (5.5° C), there is potential for thermal expansion variations that cause swelling and galling. 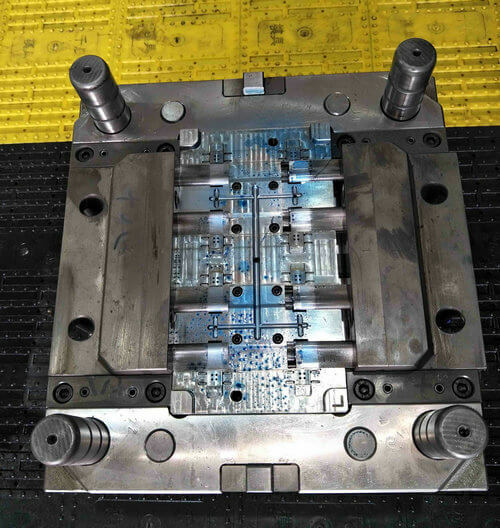 After a mold has completed a specific number of production cycles (varying with type of product and material being molded), it must be cleaned to remove residue formed during the molding process. 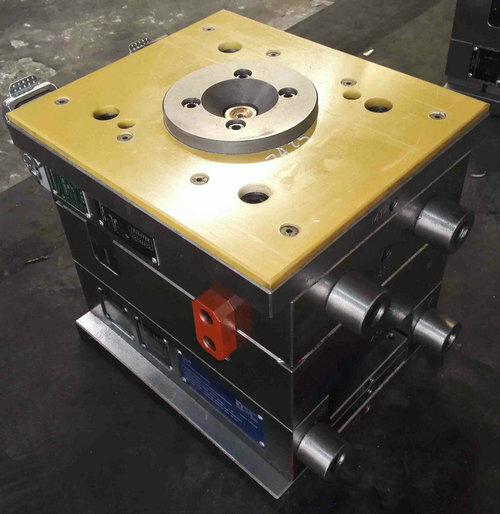 The cavity surfaces and vent areas will show the greatest amount of residue, but the ejector housing, ejector pins, and runner blocks are other areas that also collect residue. Because of the tight tolerances being maintained by the mold, this residue buildup may become enough to keep the mold from closing properly and/or force specific dimensions out of tolerance. Vent areas especially require attention. If the vents plug (due to residue), they become ineffective and higher injection pressures will be required to fill the mold. This may cause flashing, which may result in mold damage. When the mold is pulled from the molding machine, it should be thoroughly cleaned, inspected, and coated (primarily inside, but lightly outside) with a rust preventive material to minimize the possibility of damaging rust formation. The coating should be especially heavy for long-term (over 30 days) storage. It is important to clean out the waterlines and coat them. If possible, molds should be stored in a cool, dry area to minimize rust-producing conditions. Repairing damage to a mold can range from being a simple process to one of tremendous difficulty, depending on the degree and type of damage. In some cases, a repair may require only the replacement of a broken ejector pin, while in other cases, the entire cavity set may need to be replaced. The method of repair, then, depends on what caused the damage. Removing rust from the outside surface of a mold is simple and usually requires no more than a wire brushing for even extreme cases. However, removing rust from a cavity surface is a totally different situation and may even require welding and refinishing damaged areas. Alternatively, the rust may have caused so much damage that the cavity sets and other components may have to be replaced completely. Molds are expensive, custom-made products and can be damaged by many things. They require a great deal of care in their operation and storage phases. Preventive maintenance, in the form of cleaning and lubrication, (and coupled with proper care and processing) will go a long way toward minimizing damage.